NOTE: This is a PRE-ORDER. Your book will ship in early May, when the books arrive from the printer. Between 1893 and 1999 there were eight hospital based diploma schools of nursing in Toledo: Flower Hospital School of Nursing, Maumee Valley Hospital School of Nursing, Mercy Hospital School of Nursing, Riverside Hospital School of Nursing, Robinwood/St. Luke’s Hospital School of Nursing, St. Vincent Hospital School of Nursing, Toledo Hospital School of Nursing, and Toledo State Hospital School of Nursing. This core group of schools, operating for just over 100 years, sent registered nurses into our community to care for our sick and teach us how to stay healthy. Graduates from these schools are still among us and continue to provide care and comfort. The authors of this book have spoken to dozens of these graduates, who willingly recounted their experiences and shared precious photos. 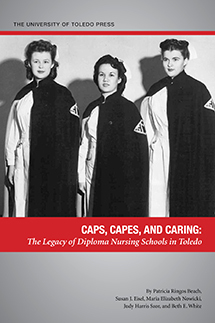 Readers will gain an appreciation of Toledo’s diploma nursing schools, and will, hopefully, experience the thrill of helping and healing, of living this life, and of learning.